Imagine you have the opportunity to start your own business by owning a hot dog stand. You go out on the street every day and sell hot dogs. If you are successful, you will make money and be able to take care of yourself and your family. If not, you will fail yourself and your family. But the money you earn is not limited to just feeding your family. It’s also an opportunity to learn how to save, market, invest, and expand into a larger businesses. The lessons on the ground will help you achieve any height you want to if you have the right attitude. So what will be your attitude? You’d make sure you had the cart on the street every day and on time. 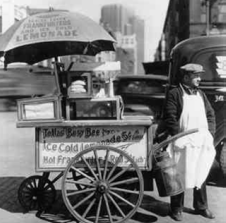 Even if it was raining or cold, you would still set up your cart and sell as many hot dogs as you could. On days when you didn’t feel well, you would still get out of bed and go set your cart up, knowing that if you didn’t, you would be behind on earnings for current needs and savings for your bigger plans ahead. More importantly, your regular customers would be able to count on you to be there consistently. You’d have your cart set up on time for the peak periods every day. You would know the busy times and the slow times, the right spots, and you’d make sure that you were ready to sell when customers were ready to buy. If you needed to stay open later than usual some days, you’d be happy to do it. You would ensure you have the best quality food available. After all, if you gain a reputation for serving great food, people will return to your hot dog stand regularly and they will recommend to others to eat there too. You’d listen to your customers if they made suggestions. And the service you provide would surely be friendly, attentive and personalized. You would get to know your regular customers by name, remember how they like their hot dog prepared and what they like to drink. You’d say hello to everyone with a big smile and a warm tone. Every person who buys a hot dog from you is actually taking care of you and your family. They would be very, very important to you. Because you own the hot dog stand, you would want to have the highest sales you could achieve every day and you would be very conscious of your costs. You wouldn’t waste food or give it away for free. You’d want to make as much profit as you could. Because your own the hot dog stand provides you with your livelihood, you would feel justifiable pride in your business. It might only be a hot dog stand, but you’d do everything to make it the best hot dog stand in the city. And your business experience and reputation will help you expand to wherever you want to go. This example uses a small business element only to emphasize that you may not always be able to choose the level you start out at. But you must make most of the entry opportunity and take pride in everything you do. No one can restrict your growth but you. Your attitude, determination and sense of responsibility will determine your growth and success. Start to feel and think the same way about your job and you will see the results. People will see the results and recommend you for your initiative, business acumen and attitude. This creative example has made managers we have mentored more attentive and responsible to the needs of their job. It has helped them achieve more by making suggestions to improve their businesses and their contributions to the success of their organization. Employees must always be made to realize that their role is critical to the success of the business and that they wouldn’t be hired if they were not needed. The success of a business is highly influenced by the commitment of every member of the team who sees your business as their business and your success as their success. To business owners and managers, we regularly emphasize that on their part, they must notice and appropriately reward dedicated and loyal employees who produce meaningful results.